HAWASSI software can simulate irrotational, inviscid wave in any circumstance from high waves in the ocean, waves in harbours above varying bathymetry, above steep underwater slope and waves run-up on a coast. Compared to nearly 100 experiments, the performance has been shown in multiple international publications to be very good, better and (much) faster than any other available software like MIKE21BW, SWASH, etc.. Handling of the software with default setting and with warnings is made easy by providing pre-processing and very extensive post-processing facilities, clearly explained in manuals and supported by GUI’s. In the workshop the basic advanced applied-mathematical background is provided, and the use of the software will be explained and trained. Participants will download a trial version on their own laptop an assisted in the first simulations. Set-up of participants’ own problem can also be guided. Background of modelling methods in Hawassi and functionalities. Installing software and training with functionalities, test cases and your own application. Register before 25 February 2017 by sending an email, including an abstract for a contributed talk if so desired, to info@labmath-indonesia.org. Registration fee is Rp. 1.000.000 for each event and a discount Rp 500.000 for attending both workshop and symposium. A limited number of students can get discount of 80% when attending both activities; for selection please send a letter of motivation and CV. d) Selected students : Rp 300.000. The fee includes workshop materials, certificate, lunch and refreshments. If you need accommodation, a nearest hotel, Villatel Salse, can be an option (www.salsebandung.com). Good performance during the RWS can lead to the offer to execute an internship (or university thesis project) at LMI or to become researcher to support the development of the HAWASSI software (www.hawassi.labmath-indonesia.org). The workshop consists of lectures, exercises and example simulations. In the afternoon session exercises by teams of 4 participants. Dr. D. Adytia, M. Woran, M.Sc, A. Wijaya M.Sc and Prof. E. (Brenny) van Groesen. Participants will get the RWS-material that includes free copies of the HAWASSI-software, lunches. For the target group, the symbolic fee is 50.000 Rp; for others the fee of 5 Million Rp may be reduced, depending on the situation. Selection of (at most 15) participants will be judged based on CV, letter of motivation and academic records, and early time of registration. 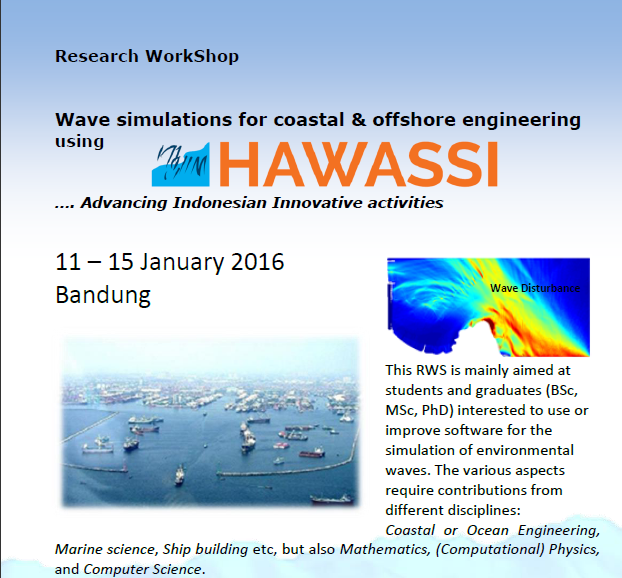 Please register by sending an email to hawassi@labmath-indonesia.org with the requested information. Registrations need to be received before 6 January 2016; for the target group, info about acceptance will usually be within 2 days after receiving the registration. HAWASSI software is designed for the simulation of realistic waves in wave tanks (1HD) and coastal and oceanic areas, harbours, etc. (2HD). 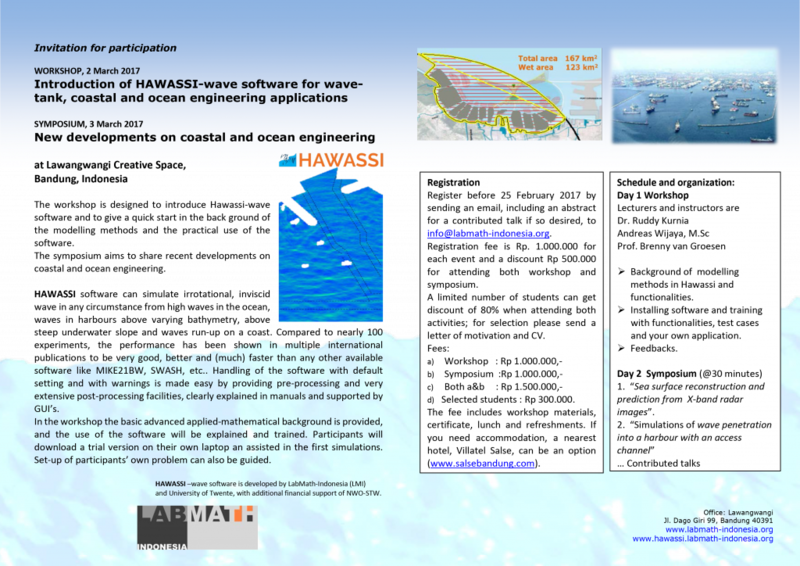 HAWASSI can simulate water waves in a way that is competitive or better than other existing software. HAWASSI-VBM (Variational Boussinesq Model) as well as the spectral implementation, the so-called HAWASSI-AB (Analytical Boussinesq). Project examples with different waves and bathymetries, manual for easy operation and scientific description. Internal flow and forces on structures.